Pecans are indigenous to North America. Highly regarded as delicious and nutritious, they also bring multiple health benefits. Pecans have been part of human diet since the dawn of the civilization, and are among the most nourishing nuts, outshined only by macadamia nuts. There is a widely-held belief that pecans' fat increases cholesterol and leads to weight gain, but the truth is pecans are full of unsaturated fats, which are actually beneficial for the body. Improving cardiovascular health. Due to their unsaturated fats, dietary fiber, and plant sterols, pecans lower cholesterol accumulations and help prevent heart attacks. Reducing the risk of obesity. Pecans can improve metabolic rate and increase satiety, promoting weight loss and helping to maintain it. Delaying age-related neurodegeneration. By preventing cell damage, pecans help to fight amyotrophic lateral sclerosis (ALS), Alzheimer's, and Parkinson's disease. PECANS ARE A GREAT SOURCE OF UNSATURATED FAT, WHICH MAKES THEM A GREAT ALLY IN FIGHTING BAD CHOLESTEROL. Thanks to their linoleic acid and other unsaturated fats, pecans are able to modify serum lipids and lipoproteins in men and women, effectively lowering cholesterol. Additionally, the nut's high content of vitamin E and other phytochemicals is believed to be responsible for its antioxidant effect, protecting blood lipids from oxidation and preventing arterial obstruction. Pecans' beneficial effects in weight loss diets are attributed to their density of nutrients, which increases metabolic rates and enhances satiety. A 100-gram serving of pecans has 691 calories, 72 g total fat (only 6.2 grams of which is saturated fat), zero cholesterol, zero sodium, 9.6 g dietary fiber, and over 19 vitamins and minerals, including vitamin A, vitamin E, several B vitamins, calcium, potassium, and zinc. PECANS HAVE MORE ANTIOXIDANT CAPACITY THAN WALNUTS, HAZELNUTS, PISTACHIOS, ALMONDS, PEANUTS, AND CASHEWS. Pecans don't usually cause any side effects, but they may trigger allergic reactions in sensitive people. In those cases, it can affect the skin, gastrointestinal tract, respiratory tract, and even the cardiovascular system. Symptoms can appear within minutes to several hours after consumption. To take full advantage of pecans' antioxidant powers, it is recommendable to eat them as a snack, whether alone or with other nuts. They can be consumed in a variety of dishes and baked goods, and their benefits can also be reaped through medicinal preparations. Oil. After being roasted and ground, pecans go through an extraction process in order to obtain a refined oil that is often used in cosmetic products and can be applied directly to the skin as a natural moisturizer. Capsules. Pecan's essential oil can be taken as a supplement, in a more convenient dosage form, in order to obtain its antioxidant and hypocholesterolemic benefits. Raw. This is most popular way of consuming pecans and reap their health benefits. Alone or combined with other tree nuts, they are a great source of vegetable protein and carbohydrates. Roasted. When roasted, pecans concentrate their content of healthy lipids, specially Omega-3, which make them a healthy snack, great for cardiovascular health. Oil. As other tree nuts, the aromatic pecan oil can be used for salad dressings and added to many dishes for flavor and a nutritional punch. KEEPING PECANS REFRIGERATED HELPS TO PRESERVE THEIR FLAVOR. IN-SHELL PECANS HAVE A LONGER SHELF LIFE. Pecan nuts are easy to find in markets around the world with or without their shell. They may be sold alone or mixed with other dry fruits as a snack. They can also be found as an aromatic oil for cooking and as a supplement in capsules. The last two can be bought online. Pecans grow best when it rains more than 30 inches (760 mm) a year. In the wild, nuts are best planted shortly after they fall in autumn. Pecan trees can thrive in full sun, partial sun, or partial shade. Pecan grows in a humid climate; the minimum average annual rainfall requirement is approximately 30 inches (760 mm), and the maximum reaches 79 inches (2,010 mm). Flowers are produced from April to May. Propagation is by budding or grafting. Fruits ripen in September and October, and are dispersed from September through December. They are generally 1 - 2 inches (2.4 - 5.8 cm) in length and 0.5 - 1 inch (1.2 – 2.4 cm) in diameter. Pecan trees can grow in many different type of soils as long they are well-drained. Summer temperatures average as high as 81°F (27°C), with extremes of 105 - 115°F (41 - 46°C). Average winter temperatures vary from 30 - 50°F (-1 to 10°C), with extremes of -20 to 0°F (-29° to -18°C). Seeds can be stored for three to five years in closed containers at 41°F (5°C) and 90% relative humidity. Pecans are wind-pollinated and can cross-pollinate with trees up to a quarter mile (400 m) away. Pecan trees have large major limbs that grow up and out from the trunk, uprightly. On older trees, lower branches become wide-sweeping, with their tips almost touching the ground. The leaves are alternate and odd pinnate with serrated margins. They are green during the spring and summer and turn yellow in the fall. Pecan tree trunks can grow up to six feet (1.8 m) in diameter and up to 70 - 100 feet (21 - 30 m) high. Pecan, or Carya illinoiensis, is a large, deciduous, American native tree from the Juglandaceae family, which includes about 59 species across 8 genera, most of them growing in temperate regions of the northern hemisphere, while some thrive in tropical areas of both northern and southern hemispheres. Another economically important nut within this family, and also widely popular, is walnut, or Juglans regia. Improved cultivars are extensively grown in the U.S. and abroad for commercial nut production. Some of the most popular cultivars in Florida are 'Desirable', 'Stuart', 'Moreland', 'Elliot', and 'Curtis', while the most recommended in Texas are 'Desirable', 'Cheyenne', 'Choctaw', 'Cape Fear', 'Shawnee', 'Oconee', and 'Caddo'. Each cultivar has particular characteristics: 'Cheyenne' has a semi-dwarf spreading form and medium to large fruit. 'Chickasaw' has a fine-textured, spreading form, disease resistance, and medium to large fruit. 'Elliot' has an upright habit of growth with a fine texture, disease resistance, and small fruit. 'Owens' has compact growth and medium to large fruit. 'Shoshonii' has upright growth habit, strong branches, disease resistance, and large fruit. 'Stuart', an old selection that is widely planted, has a vase-shaped form and large fruit, but is weak-wooded. 'Melrose', 'Candy', 'Elliot', and 'Sumner' have increased scab resistance. Variety development for the southern U.S. pecan industry has been extensive, and they are well-known for their large size and very thin shells. However, they need a long growing season to properly fill their nuts, and only the shortest season varieties can be grown in that area. Long before the arrival of Europeans, native Americans gathered and subsisted on pecans; tradition quickly adopted by the early explorers and settlers. The domestication of pecans, however, began in the late 1800's, when settlers thinned tree stands in native range leaving pecans and grass for grazing. The first seedling orchards were established in southeastern U.S., and with the invention of rail transportation, pecans and other nuts started to be shipped to urban markets across the country. Pecan is the only tree nut with commercial importance that is native to North America, and it is the most important nut crop in the U.S. It has been used for centuries by Native Americans as a food source. The pecan industry is centered in the south and southeast, led by Georgia. However, many acres are grown in Texas - where pecan is the state tree - as well as in Oklahoma and even in New Mexico and some areas of Mexico. The U.S. produced 206 million pounds (93.4 million kilograms) of pecan in 2006, including both native and other varieties. According to the U.S. Department of Agriculture (USDA), the value of the total crop for that year was $321 million USD. Depending on biological and environmental factors, pecan production fluctuates greatly from year to year, thus prices also register variations. Ornamental. Pecan shells are occasionally used for mulch in landscape settings. Cosmetic. 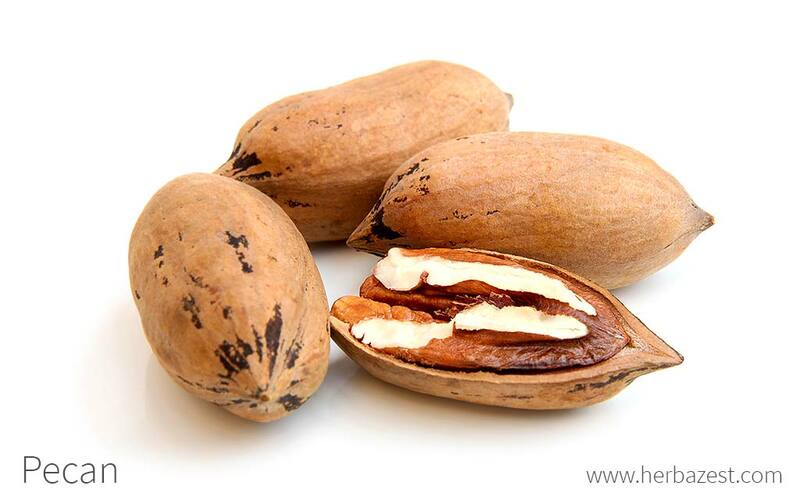 Pecan oil is used in aromatherapy and massage products, as well as in sunless tanning lotions. Flooring and furniture. The demand for pecan wood has steadily increased in recent decades. It is used for furniture, cabinetry, paneling, pallets, and veneer. Pecans are also used as bio-fuel, and their shell extract is being studied, since it may be effective at protecting meats from Listeria growth. Their antifungal properties have shown great potential use for controlling plant diseases.